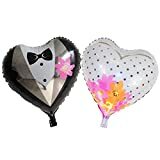 The packaging style is Bride or Groom,have two balloons in the pack. 18inch. This balloons is self sealing so no tying with fingers required. Easy enough to inflate yourself with a regular drinking straw, or have them professionally inflated with helium if you need them to float! Perfect way to display your love at your wedding or other event! These beautiful balloons will be a hit at your wedding, shower, engagement party, or other fun event! Each foil letter balloon measures about 18 inches tall. These balloons also make great props for a photoshoot with the bride and groom.